I reached out to my SIL the other day, well, we talk almost every day anyways, but she's a cake decorator and makes the most incredible cakes. She decorates them beautifully, in fact she and her daughter are quite a team, but Stephanie also bakes the cakes from scratch. Check it out here. She rarely makes a cake from a mix, and some time ago she was telling me, well, she was gushing over this carrot cake she'd made for someone, and how good the cake was and how easy to make and well, I tucked that little nugget of information away in my brain, and thought I wanted to make this sometime. I've been making and donating cakes to the local Legion, every couple of weeks, and they raffle them off and raise money for local needs. I made a Chocolate Cake a couple of times, a Buttermilk Cake and the last time a Cherry Cherry Cake. I figure this is a win win situation, more so on my part cause I get to bake and decorate a cake, and I don't have a whole cake sitting around my house, saying "just a taste, that's all, just cut a sliver" cause that sliver turns into a slice and then, the scale goes "I can't believe you ate that" , and my pants say "not again", and well, we have some interesting conversations in my house. 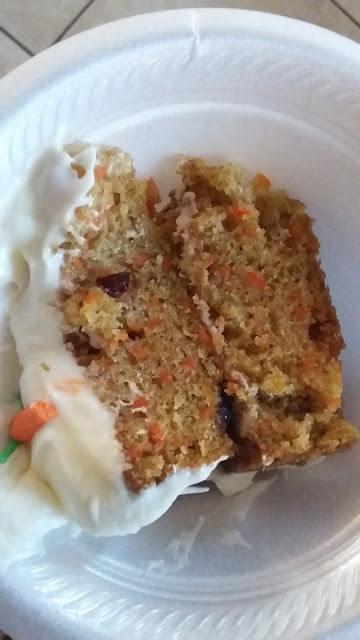 At any rate, I got this recipe, made it, and then I got to taste it, and OMG, I think I found the perfect carrot cake recipe. I'm not messing around with anything else. And if you noticed the 'toweling' around the pans, I'll tell you all about that in another post. I'm still experimenting with it. Grated Carrots and Craisins - Steff said to use the large holes on the grater so I did. The batter in the pans. And you want to rap the pans, sharply on the counter a few times to get the bubbles out. But look at those lovely bits of carrot in there. The cake just after taking it from the oven. It was resting. Please don't skimp on the greasing of the pans, these cakes stuck. And I even had a helper to get them out. 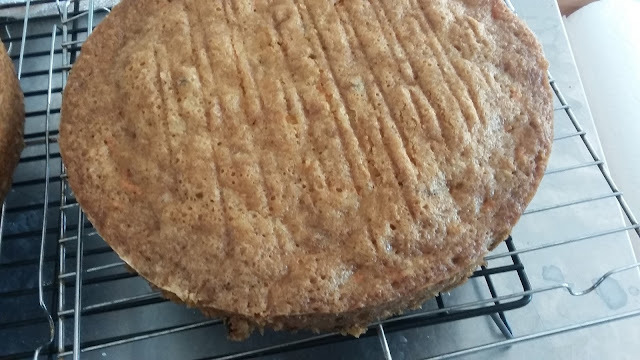 That little tab at the side, is attached to a little blade which scoots under the cake to loosen it. 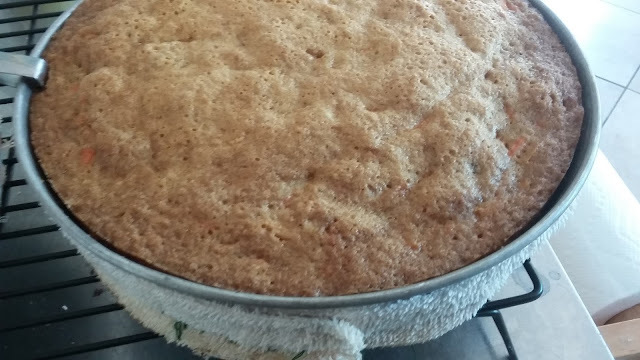 Next time I'm placing a sheet of greased parchment paper in the bottom, I think it would be a lot easier to get the pans to release the cakes. Threatening them did not work. After being released and resting for awhile. 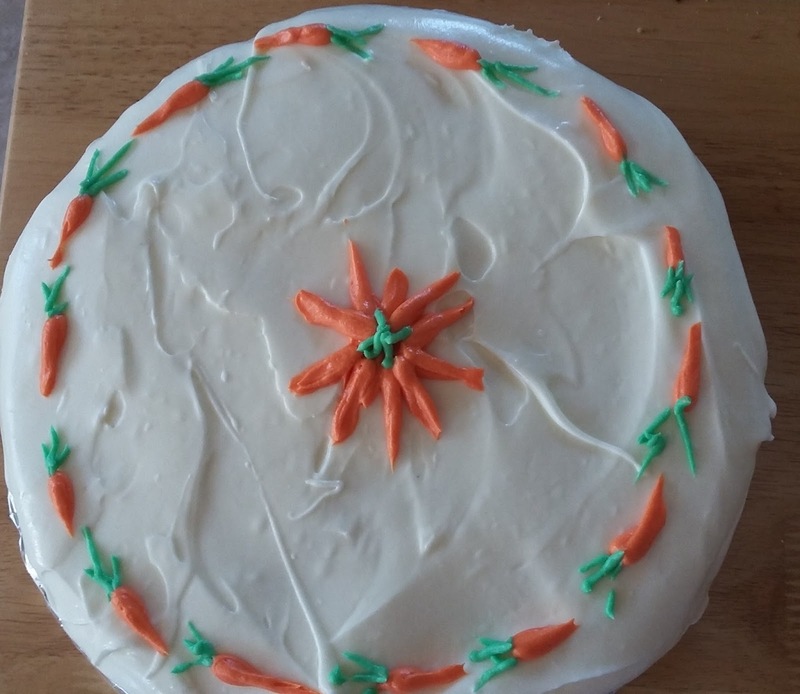 Then I had fun decorating it with some 'carrots'. If you can't have fun with the food, what's the point of playing? This is a moist, dense, rich cake, perfect for those special occasions. This moist, dense cake is the ultimate Carrot Cake. Rich, flavorful, and delicious. Preheat oven to 350 degrees. Grease and flour two 8 or 9 inch cake pans, making sure that they are well greased. Or place a greased parchment paper on the bottom of the pans, and then grease and flour the sides. Peel and grate carrots, using the large side of the grater. Measure out three cups, set aside. Mix all the wet ingredients together with a beater or with a stand mixer. Sift all the dry ingredients together and then add to the wet, mixing well. Once the wet and dry ingredients are mixed together, add the grated carrots at the end along with the Craisins and Walnuts if using them. Divide the batter evenly between the two pans. Rap the pans sharply on the counter a couple or three times to eliminate the air bubbles in the cakes. (This helps them bake more evenly.) Bake the cakes for 30-40 minutes, using a toothpick to check for done-ness after 30 minutes. Remove from oven and place on cooking rack for ten minutes to cool a little, then remove from pans. Frost with a cream cheese frosting when completely cooled. Decorate as you wish. 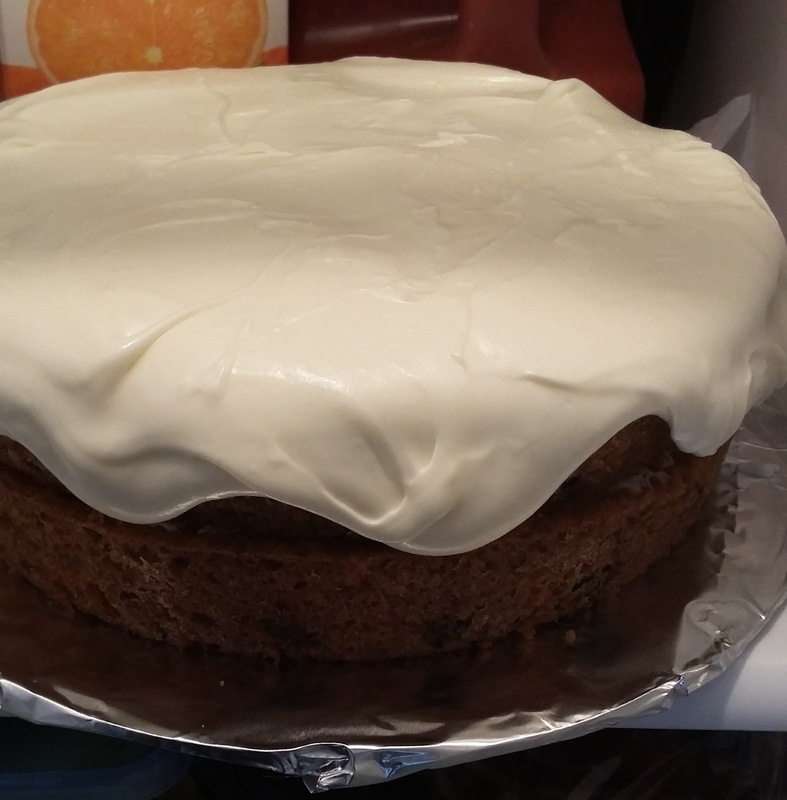 Your Carrot Cake looks fantastic, we will love it! Hope you are having a great weekend and thanks so much for sharing with us at Full Plate Thursday!